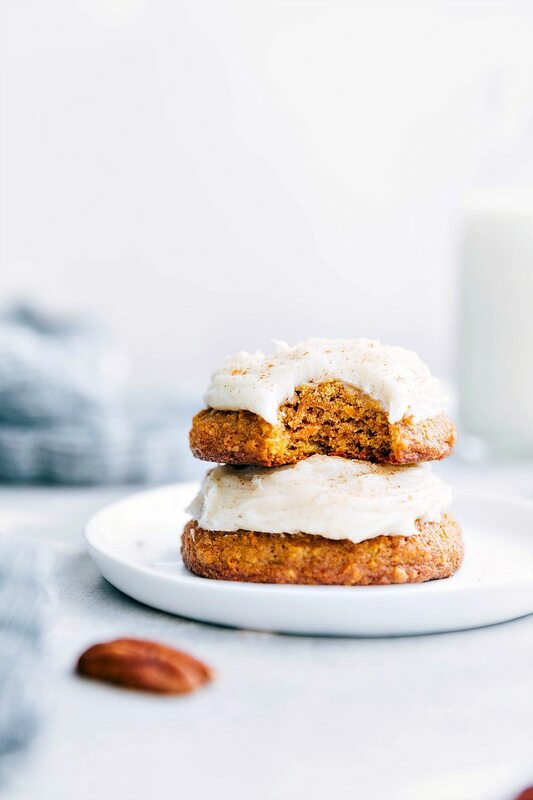 Soft-baked bakery-style carrot cake cookies with a rich cream cheese frosting. First off, what exactly is a carrot cake cookie? 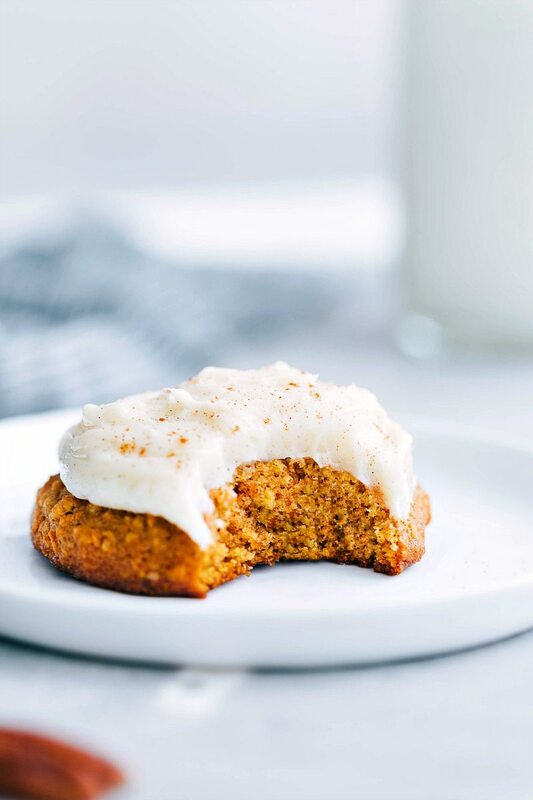 A carrot cake cookie is a cookie made with ingredients that provide a flavor similar to carrot cake. These cookies also resemble the texture of carrot cake — they are soft, cake-like, and full of flavor. 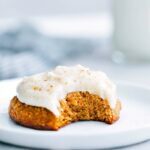 That carrot cake cookie base is smothered in an irresistible slightly cinnamon flavored cream cheese frosting to make the ultimate carrot “cake” treat! We’re huge fans of carrot cake and after sharing my perfect version of a carrot cake, I thought cookies should be next. So here we’ve got big, soft, bakery-style carrot cake cookies! These cookies are pretty much the same drill as all cookies start: creaming butter with white and brown sugar. You’ll then add an egg and some vanilla extract. Next the dry ingredients get whisked together. I’ve got some classic carrot cake spices in these cookies: nutmeg, ginger, and cinnamon. If you’re someone that likes a super spiced cookie, feel free to increase the spices to your preference. The wet and dry ingredients are then combined and mixed until just combined. You don’t want to overmix once the flour is added because that will yield denser cookies. The more you mix flour, the more time the gluten has to activate which will make your final cookie much denser than intended. Stir in the carrots and there you’ve got your cookie dough! 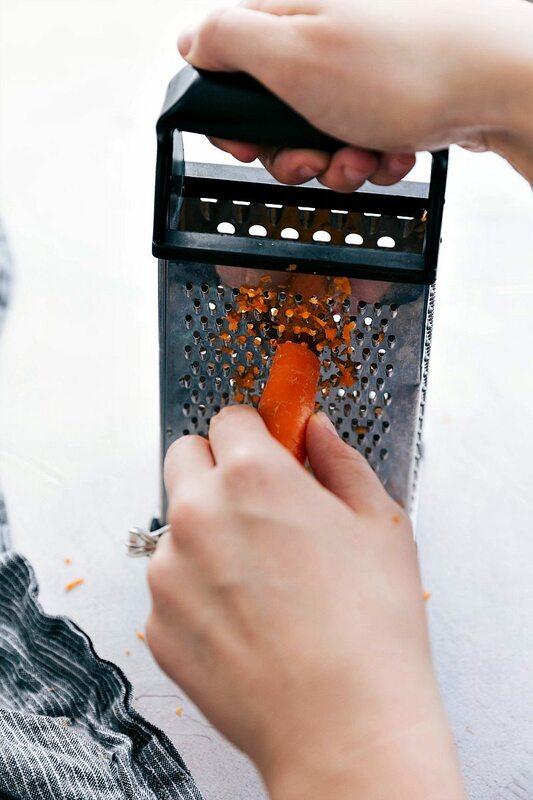 To ensure that the carrots can cook through in enough time, you’ll want to very finely shred the carrots. You can see in the picture above the size I shred the carrots to. After that I also give them a quick coarse chop just to make sure the carrot bits are as little as possible. Since the dough is pretty wet here (it won’t resemble your typical chocolate-chip cookie batter), you’ll want to chill the dough before baking it. It never firms up as much which is what will give you the soft cake-like cookies, but the chilling helps to keep the dough from spreading too much. Once the dough has chilled, bake these cookies for 9-13 minutes making sure to watch them carefully. You want to err on the side of slightly underbaked cookies to keep these soft and cake-like. 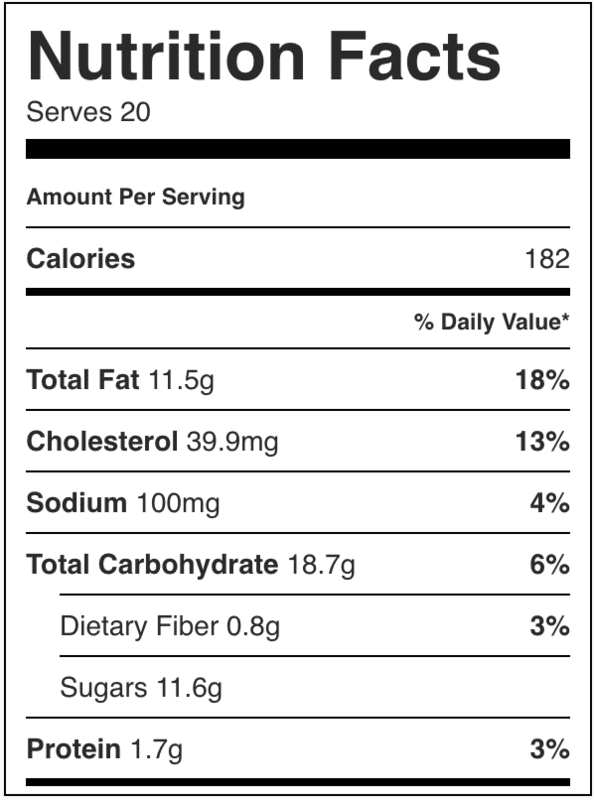 Be precise when measuring the ingredients. The most important measurement is the flour. If you press a measuring cup into a bag of flour you are likely packing in way too much flour which will completely mess up the texture of your cookies. Make sure you spoon the flour into a measuring cup and level the top with the back of a butter knife. Use the right temperature of ingredients.When at room temperature, eggs and butter form an emulsion which traps air. While baking in the oven, that trapped air expands and produces a fluffy baked good. You’ll also want to use room temperature eggs. Soaking refrigerated eggs in a bowl of warm (not hot) water for about 10 minutes is a quick way to do this. Otherwise, pull the eggs out about 30 minutes before use. Chill the dough. When you chill dough the butter solidifies which allows it to melt slower when it’s baked. This creates a thicker cookie which prevents the cookie from going flat and becoming crispy. Chilling the dough also gives the sugar time to absorb more of the liquid and become more concentrated. A more concentrated sugar is going to give you a chewier and sweeter cookie. The recommended chill time on these cookies is one hour. Honesty these carrot cake cookies (and the frosting) are even better the second day as the flavors have intensified by day 2. So, don’t stress about having to make these the same day as an event! For any cookies that don’t get eaten, store them in an airtight container in the fridge. These cookies are best within 3-4 days of being made. Peel and then finely grate the carrots. Measure lightly packed into 1 cup measuring cup and then give the finely grated carrots a quick coarse chop and set aside. In a large bowl, combine the room temperature (NOT melted) butter, brown sugar and white sugar. 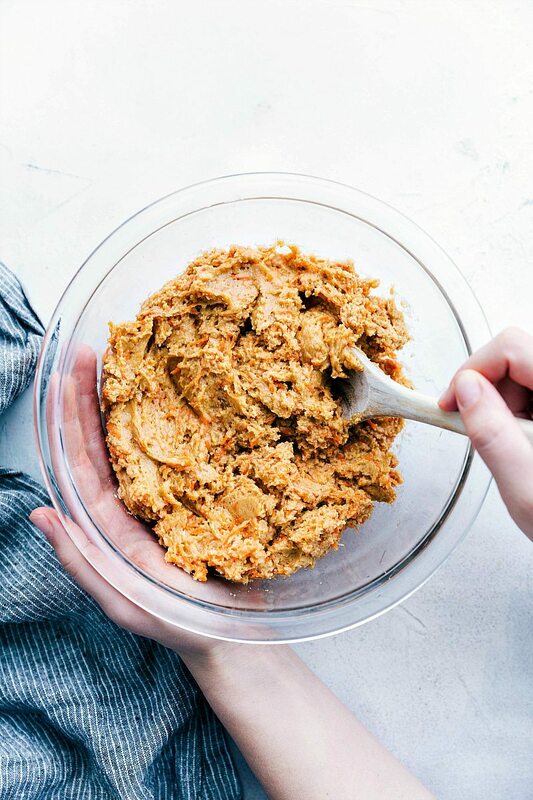 Beat at medium speed, scraping bowl often, until smooth and creamy (should look like peanut butter). Add in the egg and vanilla and beat until combined. In another bowl, whisk together the flour, baking soda, cinnamon, nutmeg, ginger and salt. Add to the wet ingredients and beat together until JUST combined. Stir in the finely grated carrots. Cover the dough and refrigerated for 1 hour. Preheat the oven to 350 degrees F. Roll out balls (the dough is still quite sticky and not as firm as regular cookie dough so it gets messy) that are a tablespoon and a half of dough. Bake 19-13 minutes or until lightly browned around edges (be careful to not overbake them. Slightly underbaked cookies will remain soft and cake-like. Cool completely. Frost each cooled cookie with frosting and enjoy! Store any leftover cookies in an airtight container in the fridge. O em gee. I love this idea!!! Carrot cake cookies = amazing cookie. And with frosting! *swoon* Pinned! I am obsessed with thick and chewy cookies too…these look incredible! And that frosting…pretty sure I’d be happy with a bowl of it and a spoon! These cookie cups are just so adorable and look fantastic! Definitely going on my to-do baking list! Pinned! I saw these on Pinterest earlier and I fell in love! They are so darn cute and I love carrot cake anything. Perfect for Easter! I’m not a big carrot cake fan but these look really cute and moist! These look incredible, Chelsea! I am such a carrot cake fan, so I am drooling over here. Too bad I don’t have one for dessert right now. So cute!! I’m always a big fan of carrot cake! Fun alternative to carrot cake! Yum! omg, these look amazing! Stopping by from the Show Stopper Saturday Link Party! QUESTION: ARE THESE CUT-OUT OR DROP COOKIES? Can you add walnuts to the recipe?